Boxing Ring is a very popular interactive game. It's perfect for Birthday parties, school, churches, carnivals and company picnics. it can be use as a bouncy jumper as well for the little ones. 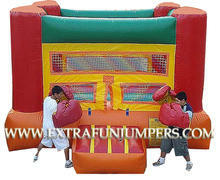 Price is for Inflatable Only, Jumbo Boxing Gloves will be add it for an additional $25.00 automatically.